In the late Summer of 1971, I was off on the first of my life's big adventures. It was time to leave the safety of my parents' home, and venture off to college. Higher education, they say, and living on my own for the first time in my life. 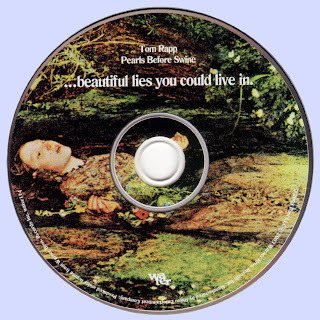 I was armed with "beautiful lies." One, metaphorical; the dream and promise that the rest of my existence would be filled with successes and happiness, always. The other, a new record album by one of my revered favorites, Tom Rapp and Pearls Before Swine. It was a very different kind of album from the Pearls' previous recordings, it kind of "rocked" a little, you know? The harmonies were tighter, there were electric guitars and drums, and, it got your attention. From the very beginning, I learned that the bright and happy future I had always been taught lay before me, may not be so simply found. "All the things she'd left behind, must make her lonely. We must touch each other, in our blindness." Hmm... Something to ponder here, for sure. This "life" thing may just be tougher than I thought. However, the inspiration and cautions I'd needed were right there on this wonderful 33 1/3 rpm creation. Finding the critical ones took years, over thirty of them to date. "The clock has metal hands. It throws the hours down, on the ground, with a thud." As a college freshman at a communications college in the City of Boston, I found many avenues of entertainment. The wide variety of venues for music of the day was of specific interest to me. It was just before my first Christmas break that Pearls Before Swine was coming to the city for a performance. Two nights at Club Passim in Cambridge, and three of my new college friends and I jumped right on the "T" and got over there for advance tickets for both nights the day the ad first appeared in the Boston Phoenix. This was an event of a lifetime, as I would finally get to see one of my life's musical heroes, live and in person, and hopefully performing songs from his extraordinary latest collection. I also secretly hoped to meet him, and tell him of his influence on my own music career, which was just taking shape. "We must touch each other in our blindness." The big night arrived, and we were sure to get seats right in front of the stage in the tiny, legendary Folk shrine. I honestly don't remember too much about the actual performance, except for being in a state of humbled awe for the privilege of being there. About all I can recall, was that Tom's scruffy trio opened with "Snow Queen", which seemed to take on an "other-worldly" mood. Perhaps it was the hallowed room in which it was performed? Perhaps this Rapp guy was something even more special than I thought? At the end of an hour or so of a meticulous guided tour of the recorded catalog of Pearls Before Swine, the band was finishing the first show of the night with "Everybody's Got Pain", leaving the crowd stomping and crying. Powerful stuff, this was. "Sometimes you get blinded by the freedom in your own eyes But freedom, just ain't freedom unless you spread it wide. Because if everybody doesn't have it, yours is just a looser chain." I knew, just KNEW, that this was the stuff of which anthems, and epitaphs, were made Fortunately, for me, it was an extremely cold and snowy night in Cambridge, and the crowd for the second show of the night was small. The audience from the first show was invited to stay. This, of course, was a mixed serendipity, as it would also mean that by the time the second show was over. Boston's primary public transportation, the subway system, would be closed for the night. (This was 1971, and Boston pretty much shut down at 11 o'clock back then.) It would be a very long cold walk from Harvard Square to Kenmore Square, but hey. I was seeing legendary Tom Rapp and Pearls Before Swine. It would be worth it, and, to paraphrase another gem from the album, 'the morning sun would indeed shine, like a promise in my eyes." My companions opted to go back to our dormitory during the intermission, as they had had their fill of the "Pearls" of wisdom. I was evidently an insatiable lad. full of a mysterious "wonder", which I wouldn't fully understand for several years until I, too, was making my living as a working singer/songwriter. It was an equally magnificent second show, and when the audience was dismissed from the venue, I hung around the door outside, with wet feet freezing in the snow, waiting. Waiting for a bold opportunity to actually speak with the man who created the work that had shaped my attitudes and perspective over the last several years. Someone whose written work I placed alongside Dylan, Cohen and Townes Van Zandt. 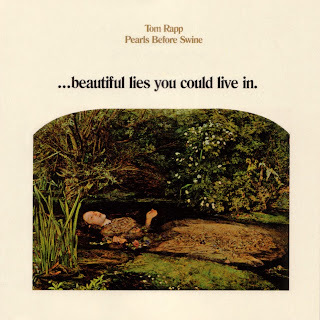 I did speak to the mercurial Mr. Rapp briefly, and we engaged in an innocent chat about guitar strings, of all things. He told me what brand and gauge he preferred, I told him my preference, then the conversation had to be unfortunately cut short. The band was hungry, and they were anxious to retire for the day. Besides, it was extremely cold and beginning to snow heavily outside 47 Palmer Street. However, Tom and I made a date for lunch the next day. Strangely, I felt as if I knew him all my life, and the barriers of the imposed perception of celebrity were broken, ".and the time goes by..." The songs of "Beautiful Lies" were still playing in my brain over again, as I began the cold, snowy three hour walk back to my bed. I never made it, though, as I stopped into an allnight deli and ran into one of my classmates. He was a shy, quiet guy. Which worked out good for him as he was Andy Kaufman's roommate. This put the concept of balance in perspective. I told him I met Tom Rapp. he was in awe of the prospect. We went back to his room, and listened. "Butterflies are very strong, they only cry when they're called upon." We cried and held each other through the Boston sunrise. So much life yet to come: marriages, children, friends, pain. 'Everybody's got pain. Listen for your brother." It was almost Christmas, so I sought out a gift to bring to my new friend, Tom, for our lunch date. A package of guitar strings of the exact brand and type he mentioned in passing the evening before. I still remember much of what we discussed that day at a Cambridge cafe, during that four hour lunch, "in a man's body is where the time goes, and the time goes by." Intricate analysis of dreams, the future, family, our past lives, beliefs, and possibilities. The elements of which long friendships and brotherhoods, are created Ours has been a friendship that has weathered over 30 years worth of new beginnings, false hopes, and the flame of love. Always with the promise of love, sometimes elusive; sometimes obvious, and sometimes even within reach. When we were lucky. "The things we see make love hard. We make blessings in runaway miracles." I gave Tom his gift of guitar strings. He made a big deal out of it, and I humbly diminished my gesture as a 'simple thing'. "Someone to love, someone's child, are simple things it's true." He played on them that night in a beautiful performance for the ages. "God appears often, and if He were lies, I'd promise you beautiful lies you could live in." Thank you, Thomas Dale Rapp, my precious friend, for opening the many doors of "Beautiful Lies". I think I now know "where all the butterflies must go." Words and Music by Tom Rapp unless as else stated.